The medical community is uncertain of links between gadolinium contrast agents and patients reporting headaches and other ill effects, but there is growing cause for concern. As a result, there is a push for new kinds of contrast agents. Magnetic resonance imaging (MRI) puts our brains in the centre of a gigantic magnet, which polarises the magnetic moments of water protons. When this polarisation is perturbed by radio frequency pulses, the protons in different tissues take different times to relax back to equilibrium, giving contrast between tissues. In the US, around 30% of patients undergoing MRI scans are also injected with gadolinium contrast agents to improve the clarity of the images; they speed up the relaxation of the hydrogen atoms in water. This is often the best option for soft tissue scans and many cancers, with over 100 million doses administered in the last 25 years. There are no widely used non-gadolinium options. This was fine until 2006. Then these imaging probes were linked to a rare but severe and potentially fatal disease, nephrogenic systemic fibrosis (NSF), which causes thickening and scarring of the skin and internal organs in patients with poor kidney function. Gadolinium was even found in patients’ skin and internal organs. The US Food and Drug Administration issued a black box warning advising caution in patients with kidney injury and advised against the use of three agents in cases of severe kidney problems. Gadolinium is toxic, so in contrast agents it is chelated to a polycarboxylic acid ligand such as DTPA or DOTA to reduce the danger. The chelated complex is excreted via the kidneys. The nine different brands of contrast agent available today differ mainly in their chelating ligand, and the bond is stronger in some than others. ‘Observations suggest that the weakest bonds are linear and non-ionic, and the strongest are macrocyclic and ionic,’ says neuroradiologist Emanuel Kanal at the University of Pittsburgh Medical Centre in the US. ‘The two agents with bonds that are linear and non-ionic happen to be strongly associated with NSF,’ he adds, namely Omniscan and OptiMARK. With poor kidney function, agents circulate longer in the body, potentially allowing the gadolinium ion to break free and bind to biomolecules such as phosphates. The incidence of NSF is highest in patients who received contrast agents that use the chelates that were the least kinetically inert. Several agents – macrocyclic and linear – have had no definitive links to NSF. In 2014, the picture became more complicated when Japanese scientists reported gadolinium in the autopsied brains of deceased patients who never had severe kidney problems.1 ‘We don’t know what clinical significance there is to this, if any,’ says Kanal. ‘We don’t know the molecular form of this gadolinium.’ A small amount is also retained in the skin, liver and bones of patients. The amount appears to vary by individual agent. Some scientists have begun to discuss ‘a family of gadolinium disorders’. 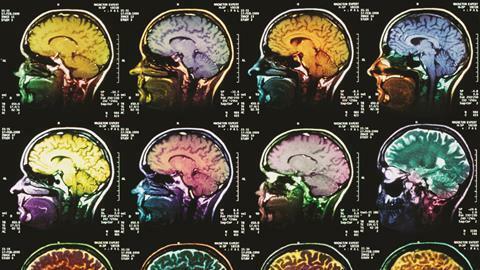 The potential concern is heightened for patients who undergo multiple MRI scans, such as patients with multiple sclerosis or underdoing brain tumour surgery. This year, a US patient with normal kidneys who had undergone 61 contrast brain MRI scans was found to have significant gadolinium deposits in her skin. Such accumulation was not supposed to occur. Gadolinium works because it has seven unpaired electrons, making it paramagnetic – the influence of their large local magnetic fields shortens the T1 (longitudinal) relaxation time of nearby water molecules. But only Gd-based paramagentic agents are approved for use in the clinic. These agents are especially useful for diagnosing brain tumours, whose leaky blood–brain barrier permit their entry, and other cancers. But with safety concerns there is an extra impetus to find better alternatives or lower dose regimes, especially since avoiding these agents leaves clinicians with limited diagnostic insights. Industry is not investing heavily to plug this gap, according to many in academia, but myriad strategies to yield new contrast agents are underway in research centres. One option is to use manganese, which shares many of the properties that make gadolinium a great T1 imaging probe. High-spin Mn2+ contains five unpaired electrons in its outer d-orbital, which also shortens the T1 relaxation time of water protons. Peter Caravan, a chemist and radiology professor at Massachusetts General Hospital in the US, recently reported a manganese chelate that was comparable to Gd3+. A trans-1,2-cyclohexane linkage and pyridyl-N donor were included within the chelate backbone to slow Mn2+ dissociation.2 In mice, the complex was eliminated from the body via not only the kidneys but also the liver, with less than 1% remaining 24 hours after injection. Caravan’s team also conjugated the complex to a fibrin-specific peptide, guiding it to sites of injury and offering an enhancement equivalent to the best gadolinium analogue in a rat model of arterial thrombosis. ‘Manganese is what most people have turned their attention to now,’ says lanthanide chemist Dean Sherry at the University of Texas in the US. ‘Gadolinium has a lot more flexibility. 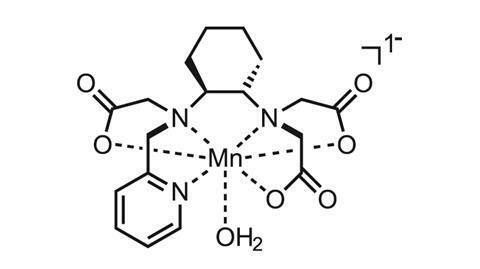 Trying to make a manganese complex that isn’t going to fall apart in vivo is difficult. But manganese is a natural element in your body already.’ Still, manganese in ionic form shows neurotoxicity, with a lethal dose in mice of 0.3mmol/kg when injected intravenously. ‘Extreme exposure to the metal leads to central nervous system toxicity,’ explains Dipanjan Pan, director of the bioinstrumentation programme at the University of Illinois in the US, who warns that significant research is needed on the safety of manganese agents. Pan’s lab has used manganese to target blood clots and image blood vessel ruptures. ‘The key has been to find out if the leakage of ionic manganese can be prevented during its systemic circulation,’ Pan explains. The focus of Sherry’s lab is on a new class of complexes that act as special paramagnetic chemical exchange saturation transfer (Paracest) agents. These structures are rich in hydrogen atoms. They offer an indirect detection method that measures changes in the tissue water signal as a result of saturation of a frequency-shifted proton that is undergoing chemical exchange with tissue water. Paracest agents are complexes usually based on paramagnetic lanthanide ions other than gadolinium, such as europium. ‘The water becomes bound to the lanthanide and you selectively excite the water molecule to cause a contrast effect. But the nice thing is that you can turn the contrast agent on and off [via a radiofrequency pulse],’ explains Sherry. The drawback is that these agents are not as sensitive as gadolinium, which means you have to put more into the body. ‘It will be very exciting day if we could get to the point where they are equally sensitive as gadolinium,’ Sherry remarks. Complexes based on transition metals cobalt, iron and nickel have also been used. 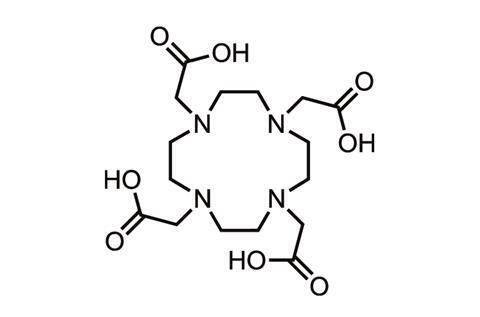 The structure of the organic part is what makes a big difference for Paracest. The molecule can be designed so that the signal is sensitive to lactate and the acidity of the environment, which can be important flags for diseased tissue. But many chemists believe in improving gadolinium-based agents, including Zheng-Rong Lu at Case Western Reserve University in Cleveland, US. ‘We know how gadolinium-based agents behave and it is easier for us to talk to regulatory agencies about this,’ he says. Lu is working on fullerene-containing cage compounds around 1nm across, which will encapsulate the gadolinium complex. ‘The key is that these gadolinium compounds cannot escape the cage and they are excreted along with the cage,’ says Lu. He says preliminary results suggest efficacy can be improved at least 10-fold, due to increased T1 relaxation effects on water protons. ‘These new cage compounds have a stronger influence on multiple water molecules, which is why it has a higher efficacy,’ he explains. Like others, he is also seeking to add discrimination to clinical contrast agents. 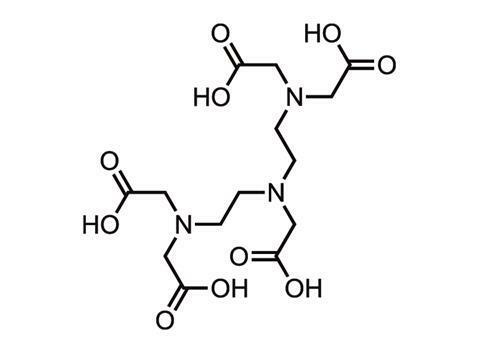 He added a chain of five amino acids to a gadolinium contrast agent to target fibrin–fibronectin complexes in metastatic tumours in mice.3 While no current imaging technology in the clinic can discriminate tumours or metastases smaller than 2mm in diameter from healthy tissue, this homing strategy detected tumours as small as 300µm – just a few hundred cells, Lu notes. Another strategy is to design probes to distinguish tissue according to temperature, acidity or oxygen levels, such as fluorinated probes that contain one or more fluorine atoms that resonate at a particular frequency. A paper in 2014 described a complex involving the rare earth element dysprosium and fluorine in the form of a triflouromethyl group. Several of the dysprosium complexes were conjugated to a biodegradable chitosan-based vector, which went to muscle tissue after injection.4 ‘As the resonance frequency of the fluorine is very sensitive to temperature, the signal (using spectral imaging) allowed the local temperature to be deduced,’ explains lanthanide chemist David Parker at Durham University in the UK. Elevated temperature is often characteristic of certain inflammatory diseases such as fibrosis of the liver or kidney. Parker has been developing paramagnetically shifted (Parashift) agents for proton MRI, with collaborators at Newcastle University in the UK. This is an agent where the reporting signal is paramagetically shifted and occurs well away from potentially interfering signals such as water. The key trick is to ‘shift the resonance frequency of the observed label far away from the position of the abundant water signal’ and engineer the complex so that the probe t-butyl labels resonate about 20,000 Hz, at a magnetic field of 7 Tesla, away from the water resonance frequency, Parker explains. 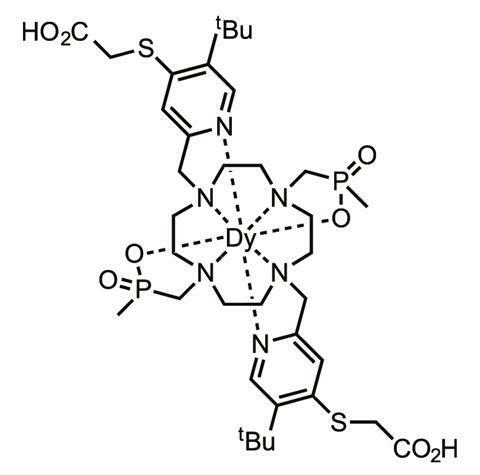 Importantly, the nine-hydrogen t-butyl group was placed about 6.6Å from the dysprosium or thulium ion in a coordination complex. ‘Under these conditions the t-butyl probe resonance relaxes very quickly and can be observed selectively at the same time as the water signal, and hence dual imaging has been undertaken,’ says Parker. Once again, the resonance frequency inherently reports the temperature of the probe’s location. He is optimistic that his new Parashift agents can be engineered to provide – at low doses – information on temperature and pH or cation concentrations in real time and to generate temperature and pH maps in key organs. The recommended dose for MRI contrast agents is typically 0.1–0.3mmol/kg and requires gram quantities of gadolinium-based drugs in the clinic. ‘Toxicity is all a matter of dose and exposure,’ says Caravan. ‘Another way to address this problem would be to make the gadolinium-contrast agents more potent and so use a much lower dose.’ Many remain convinced that the best macrocylic agents retain their gadolinium ions. Low molecular weight complexes like Gd-DTPA are stymied in their relaxivity by their fast molecular tumbling, generally at a rate of about 2GHz, whereas most clinical scanners operate at 65 or 130Mhz. ‘The frequency match is way off, analogous to someone in a relay race running 100 times faster than the person taking the baton,’ says Caravan. Ideally the rotational motion should match closely to the frequency you are imaging at. Various strategies have been tried to slow molecular tumbling, including the use of polymers and proteins and tying together chelates. The controversy over gadolinium is not going away. Reports have been piling up of gadolinium from MRI scans getting into waterways near European and American cities. This year, a study in San Francisco bay found levels at 17ng per litre, or 27ppb, approximately 14 times higher than the background concentration measured before widespread use in MRI.5 ‘I don’t know if the increase in gadolinium in the bay now poses a threat to organisms there, but I think it’s unlikely,’ says Russell Flegal at the University of Santa Cruz, California who led the study. Much of it is as complexes such as Gd-DTPA and so unlikely to bioaccumulate and rise to toxic levels in fish consumed by people. Still, no-one thinks rising gadolinium contamination should be ignored. The trend looks set to continue, given an increasing use of imaging in medicine. ‘It’s a cultural thing,’ says Sherry. ‘You hear people say “That doctor must not know what he is doing – he didn’t even order an MRI”.’ For many radiologists and hospital staff who order medical supplies, which type of gadolinium agent is used doesn’t matter, so long as it is gadolinium. ‘If I were king for a day, I’d remove many contrast agents from the market,’ says Sherry. ‘I’ve been injected with gadolinium a couple of times and I make sure I know which agent it is.’ Meanwhile he and others continue to dig for future alternative MRI contrast agents to better detect cancers and other ailments, while seeking to avoid toxicity issues.